CLICK HERE FOR AN OVERALL VIEW OF THE PLEDGES! CLICK HERE FOR OPTIONAL ADD-ONS! CLICK HERE FOR THE STRETCH GOAL MAP! This is a miniatures-only project and has been created in order to co-fund the tooling of Forest Goblin troop miniatures, cavalry and other (larger) goodies in hard plastic (HIPS) as well as some miniatures of this army in high quality polyurethane resin. This project starts by featuring a forest goblin infantry multi-part plastic kit (with additional weaponry choices as stretch goals get met). This unique worldwide fantasy army provides miniatures fitting for both skirmish and army gamers & collectors! 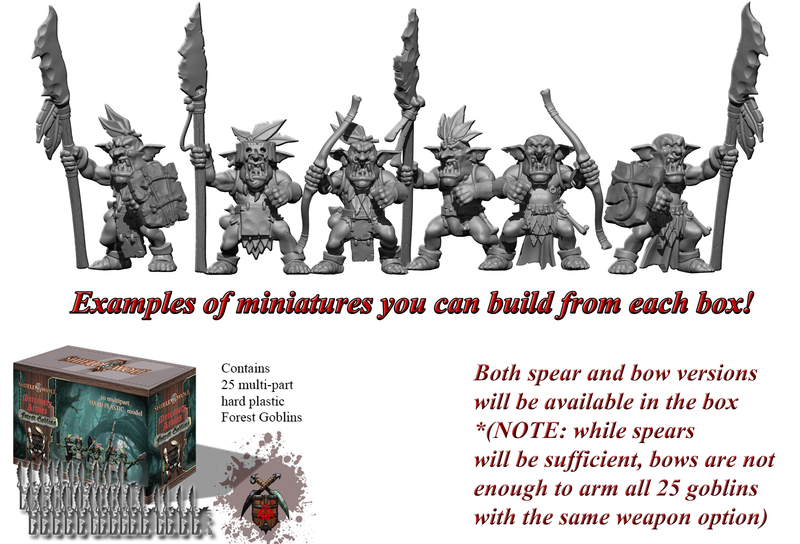 Each Forest Goblins box will include enough parts to assemble 25 multi-part hard plastic miniatures allowing you a large variety of choices. As stretch goals pile up, more weapon options will become available on the sprues included in each box for both Gold and Silver pledge levels. To add more variety you can also choose to enhance your greenskin army with Orcs! All polyurethane resin casts are done by Shieldwolf Miniatures in-house. We have proven our expertise in casting over the past several years with products available both directly from our webstore and worldwide retailers. All plastic kits for Shieldwolf Miniatures are manufactured by Renedra Ltd., an experienced and valued manufacturer who have produced hard plastic kits for Warlord and Perry Miniatures, as well as our own Mountain Orcs. Note: All miniatures from this campaign are supplied unpainted and may require assembly. Shieldwolf Miniatures(TM) products are in 28mm "heroic" scale. CLICK HERE FOR AN OVERALL VIEW OF THE ADD-ONS! All Goblin miniatures come supplied with a 20mm square base. All Orc miniatures come supplied with a 25mm square base. click on image for a larger picture! Goblins are especially popular in a large number of fantasy settings, so there's only the embarrasment of choice! They can be used in various RPGs or skirmish games to create dangerous warbands, Shieldwolf Miniatures own game "War is Coming" for which rules are in development and will be made available for free (as always), or The 9th Age (T9A) just to name a few! This is the fourth Kickstarter project Shieldwolf Miniatures has created and with the (massive) experience gained so far we believe homework has been done and -excluding natural disasters that are out of our hands- this campaign will again run smoothly. A crowdfunding project may inevitably carry risks we had not (or could not) foresee. However here at Shieldwolf Miniatures we hold very dearly to our reputation! We don't do excuses! For this reason we are offering a money-back guarantee (just like we did in our previous Kickstarter campaigns) to prove the dedication we have in this project. If for any reason you do not like the quality of what you receive, please mail them back within 30 days of receiving your rewards; we will refund you 100%, fees included, no questions asked! The good part is that this project has an easier structure compared to our previous ones, so the pledges will be easier to organize. We have a number of sculpts ready, the sculptors commissioned are professionals whom we have faith will keep their deadlines and we have time slots registered for everything. Please note this is the ONLY pledge level that does NOT allow access to the free items unlocked during this project. Note: If you want add-ons, simply increase the appropriate amount of your pledge. This pledge level rewards you with one poylurethane resin Forest Brutgoth (100mmx100mm base version). It allows access to the KS exclusive head version. If you wish to add a howdah, please augment your pledge by $15. If you wish to pledge for the Mountain Brutgoth version (100mmx150mm base), please pledge a total of $80 (or $95 if you wish to add the howdah). No additional P&P will be charged for any eventual add-ons. NOTE: Please take notice that both of these items are currently set as Stretch Goals and need be unlocked first. Thank you. Choose from either the Goblin Starter Army OR the "Forest Goblins & Orcs" Boxed Set! Note: If you want add-ons, simply increase the amount of your pledge. -1x the "Forest Goblins & Orcs" Boxed Set + 1x Raiding Party! -the Forest Goblins Campaign Army! This pledge is intended for verified retailers only. With this pledge you receive 8 boxes of each one of the two plastic sets from this campaign (Total 16 boxes, MSRP >400$), plus additional offers on any other plastic sets this project unlocks. +FREE SHIPPING WOLRDWIDE is included.